Length: I spent more than 25 hours on it, and I am still in the middle of my second playthrough (though my reading speed is really slow). My guess is the average Japanese person will need around 15 hours for a first full playthrough. 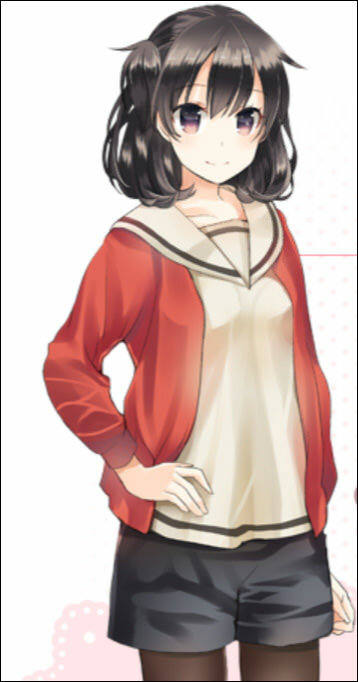 The game starts with our main character, Rin (who’s 17). A typical Japanese high school girl when we meet her, she is buying a taiyaki (fish-shaped cake) eagerly when she (almost) trips after running out of the store. Suddenly, she finds herself in somewhat unfamiliar surroundings, although the buildings almost look the same. Only the signs and atmosphere have changed. Confused, she tries to ask pedestrians for help, but after failing to communicate with them, her “angel” finally appears: Ruka, a really adorable girl who tries to ask Rin where she is coming from. 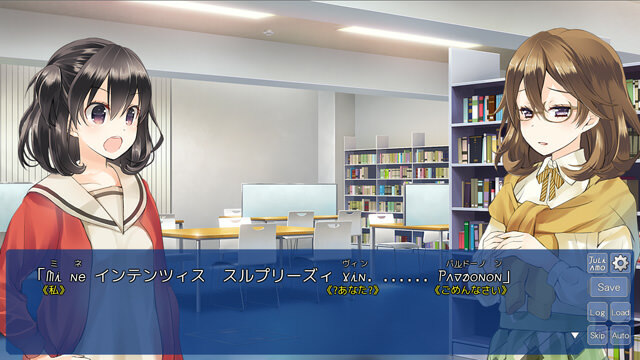 Now, if you’re asking why both parties can’t understand each other, it turns out both the pedestrians and Ruka talk in “Juliamo,” as Rin gets to know later. Yes, Juliamo doesn’t really exist in our world, and the developers built a new font specifically for this occasion (you can download that font here), but it’s based on a constructed language from our world: Esperanto. Honestly, the first time they spoke Juliamo in the game, I felt as lost as Rin while trying to understand what they were saying but failing completely. As the game went on, I could pick up some words that sounded similar to English, German, Spanish, Italian, French, etc., which isn’t too surprising since Juliamo/Esperanto is like “mixing different European languages,” as a friend told me. Even though this review is not about Juliamo/Esperanto itself, because of how heavily the game makes use of this language, it’s impossible not to speak about it. Back to our main character, Rin, who is described as an ordinary girl who we, the audience, should be able to empathize with the most. Still struggling with communication, Rin tries to speak in English and in Japanese, and after some exchanges, Ruka recognizes the word “nihongo” (Japanese for “Japanese”). Luckily, she speaks a bit of Japanese, so Rin just found her new temporary home in Ruka’s flat. 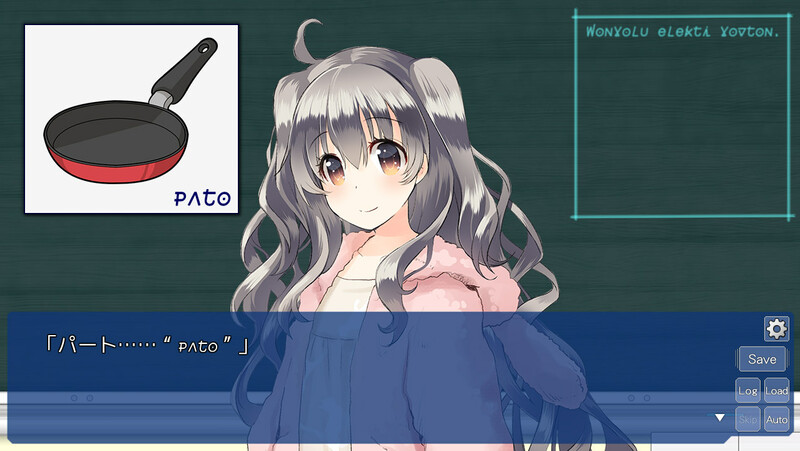 During her time there, the game introduces us to some aspects of the world and the new language. Ruka will be the teacher for Rin in learning the basics of Espera err, I mean Juliamo, which mainly means numbers, weekdays, kitchen utensils, common phrases or body parts, and much more. 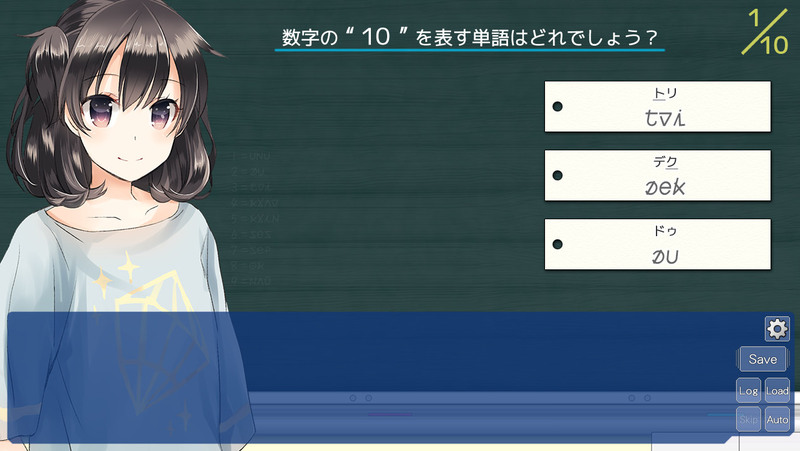 The game switches between this “studying mode” and normal visual novel (VN) mode. Quiz: What word represents the number 10? My favorite studying session—click on the body parts and Ruka will tell you what it’s called in Juliamo. So fingro = finger and fingroj = fingers, I guess? If you’ve completed the game once, the full translation for every line in Juliamo will be displayed in blue above the text, adding good replay value. You’ll feel like you’ve graduated from Juliamo classes and are able to understand them on your first encounter! They’ve also added an in-game dictionary and improved the study mode, which you can access in the main menu, with the recent update. As an Isekai-game, the focus lies heavily on the main character exploring a part of the world instead of being driven by some exciting plot. 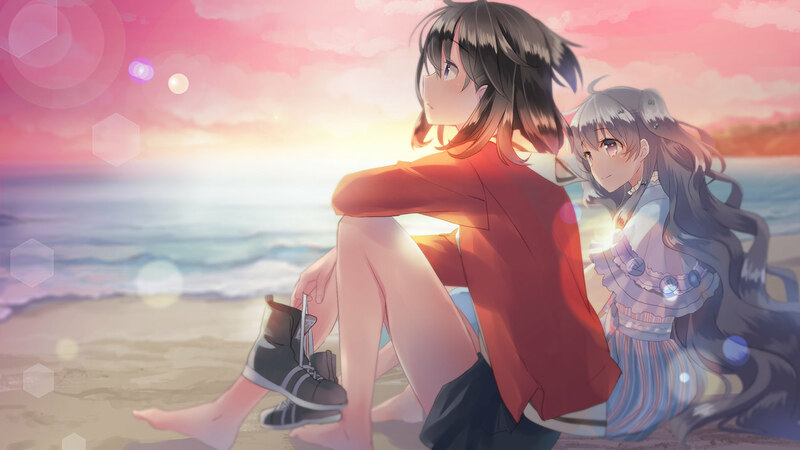 Rather, it follows Rin and Ruka through their daily lives, showing how they come closer together at the same time they learn how to communicate with each other. “Kotonoha”, Japanese for “word(s)”, will have a deeper meaning as you progress through the game. Amrilato, on the other hand, is Esperanto for “a romantic relationship,” even though the word is connoted as “love” in the game. I personally think they chose a clever title. Certain Juliamo words and grammar are explained through the game, and the language is mostly easy to understand, though I had a bit of difficulty following the explanations for some of the specific parts about the parallel world (but that’s because of my Japanese skills, nothing wrong with the game itself). Aside from the choices for the quizzes, most of the plot choices that appear in the actual game barely have any influence. That’s one of the weak points the game has. I prefer that my choices will also affect the route the story will progress, although most of the choices were Juliamo-related. They could have added more choices about the in-game world, like going to a certain place or doing something that might turn the tables of events. Overall, while the gameplay and story were really enjoyable with the new language and environment, I wish the visual novel had more fantasy/magic elements instead of just a realistic parallel world. Fun fact: The studio’s name, SukeraSparo, is based on Esperanto too and means “sweet taiyaki”. There aren’t many characters in the game, so our focus lies on our main character and the girl who’s helping her out. I like them very much because I can sympathize with them in a lot of ways. Since I’m bad at remembering names/characters in a big cast, I was quite relieved to know that we have a small cast this time with main characters that are fairly developed. Their behavior was realistic in most cases, and having someone as adorable as Ruka as the love interest gives the game a lot more enjoyment. The “representative” from our world. She got lost in a parallel world and has been given the status “Vizitanto”, which means she receives money monthly from the state and gets a discount on buying goods from certain stores. She’s quite carefree, is a bit bad at studying, and sometimes behaves like a middle-aged man. She’s staying at Ruka’s home studying Juliamo, but occasionally she leaves the house to interact with other people. I had quite a lot of fun following her while she attempts to learn the language. Her spirit animal is the tanuki (raccoon dog). The girl that’s helping Rin out for the time being. For some mysterious reason, she can speak a bit of Japanese. She’s also attending school regularly, or that’s what Rin’s been told. She has the status of being a “Korespondanto,” which means she can take care of vizitantos (in this case, Rin). I’m not sure how to best describe her, but she’s really cute and adorable. Selflessly helping Rin out and letting her stay at her home, even though she’s a complete stranger, takes a lot of courage and trust, in my opinion. Having Ruka teaching Rin makes the studying sessions 200% more exciting. 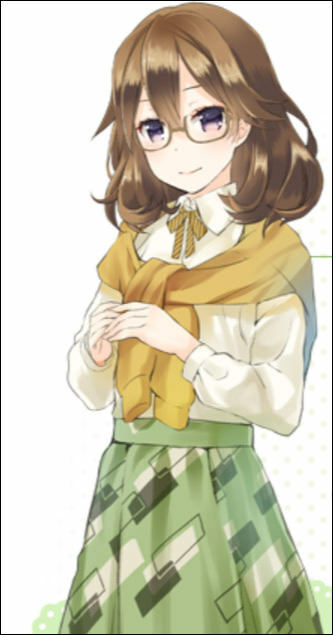 What I really have to talk about, though, is her voice actress, Uchida Shuu. She’s a fairly new voice actress (Warspite, from Kantai Collection), and maybe she has the advantage of living in Australia for a long time, but her voice acting for Ruka was excellent. It was really smooth, easy to listen to, and despite pronouncing the Japanese wrongly (Ruka’s not very good at Japanese), her stuttering adds a certain cuteness factor. Here’s a preview of her voice, and here’s a bit of how she speaks Juliamo. More can be found on the SukeraSparo website under “Character”. Someone who’s working at the Vizitanto-Administration Bureau. Usually, she’s a librarian at a library nearby. She’s helping out Rin and Ruka, acting like a mother figure for Ruka. I don’t want to spoil too much, but she’s quite important since she’s one of the few people Rin can freely interact and talk with. Her spirit animal is the owl. Other people appearing in the game only play a small role, but they’re all voiced. I really love the character design and illustrations. Some of the CGs are a real feast for the eyes. The artist is Naruse Chisato, who’s also drawn the art for Nurse Love Addiction‘s sister game Shirokoi (full title: Hakuisei Ren’ai Shoukougun). The drawings have something “fluff” around them, but are also clear, and the backgrounds are well-made. The character portraits aren’t that diverse, like in Seisai no Resonance, Akai Ito, or Aoishiro, but I can still see that they put a lot of effort into them. I mean, just look at this. This could make a good wallpaper! I’m not giving it a 10 because I would have loved to see the characters in more varied clothes and maybe more places/rooms. They could at least have shown the kitchen or Ruka’s room, but the most we see of Ruka’s room was just her bed. A rough outline of the apartment was included in the artbook, so it’s a shame that we didn’t see more in the actual game. The opening and soundtrack weren’t that memorable, but they fulfill their function well. There were some calm piano tracks, and the soundtrack during the studying sessions didn’t distract. The opening is a bit too rock-ish for me, though it isn’t bad or anything, either. There weren’t that many tracks to begin with (12 to be precise) so there wasn’t much diversity in the background music section. Overall, the soundtrack didn’t stand out too much but they still set the mood well. 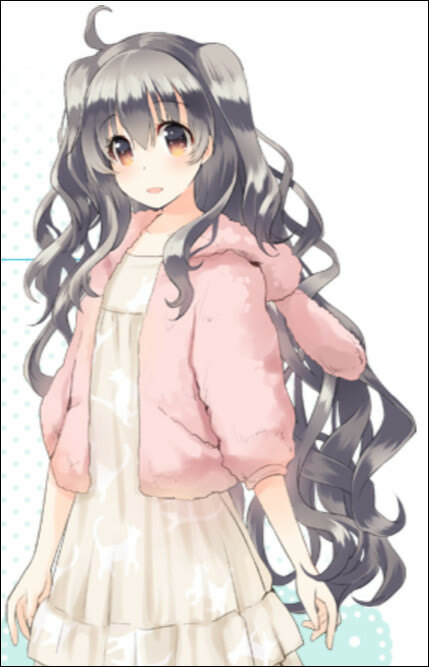 Being an all-ages visual novel with a decent length, you can expect maximum fluff. We do not get much physical contact between our two protagonists, but there’s a much more important relationship these two have: communication. This adds a lot to the emotional aspect. 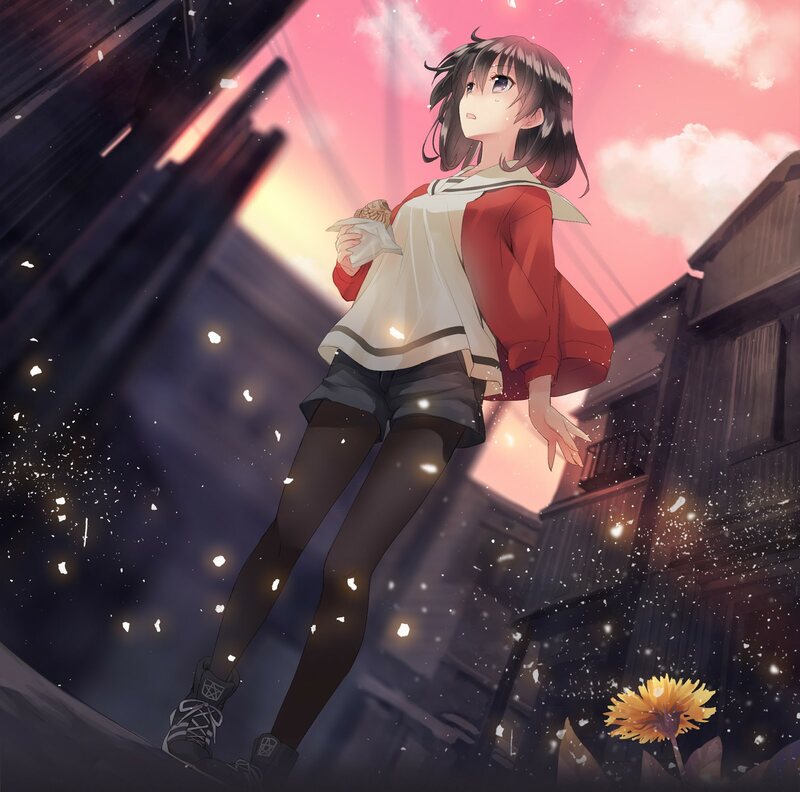 Having Rin being lost in an unknown world and not talking to many people due to the language, the game does a great job in conveying the feeling of isolation and loneliness Rin must have. Ruka being one of the few people she can freely talk to is a relief for her, and eventually they both realize how they’re already dependent on each other. Their relationship never felt like subtext or “just friends being close”. The only issue I had was that after some really intimate and sweet moments, the game would fade to white and the next day would start, but it made any progress they had really rewarding. 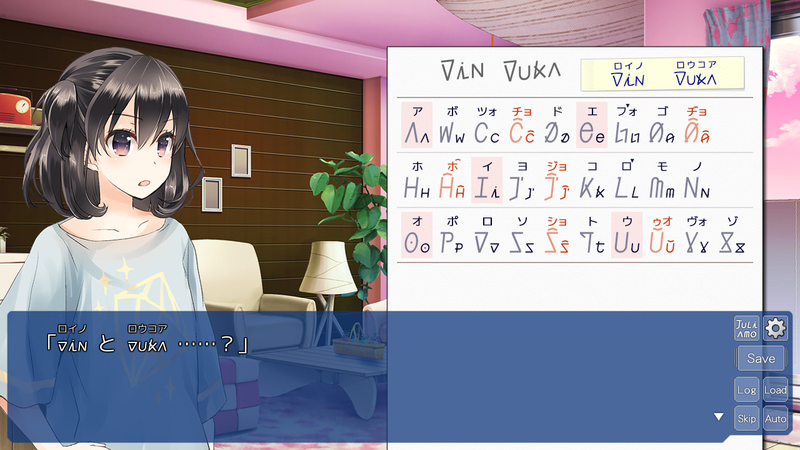 Miscommunication is a common theme in yuri, but the game has a new approach of solving it. Our two main characters yearn to convey their feelings in the other’s language, so they cannot talk things over. They have to learn each other’s language in order to work through the constant series of miscommunications that drive the plot. I’m giving it a 7.5 because despite revolving around the romantic relationship between the two main characters, it doesn’t come up as often as I would have wished. I’m giving it a 9, and I know I’m just doing a guest review here, but really, but it’s definitely one of the best and fluffiest VNs I’ve ever played (considering I’m a somewhat regular yet picky Yuri-VN player). The pace wasn’t slow, despite not having much progression in the relationship between the two MCs for a while. Overall, you can divide the game into two parts: The first half was mainly about getting to know Juliamo, and the second half about the world the characters live in. I think including a new language (for most of us) which is still really easy to learn is a great aspect of the game. For me, it was quite enjoyable and fun, and it even caused me to look up the grammar and language of Esperanto itself in more depth. Esperanto was a clever choice for the developers since it’s not bound to one country or group of people. The game will not teach everything, of course. It is not possible to learn the language just by playing the game, but it can be a starting point to introduce you to the language and maybe capture your interest for further studies. If not, I personally had a great time with this VN and really hope we get a localization someday so I can share my love for this title to lots of people! I greatly recommend it to everyone, if you have the chance to check it out. The game was so enjoyable that even one of my non-yuri friends liked it! 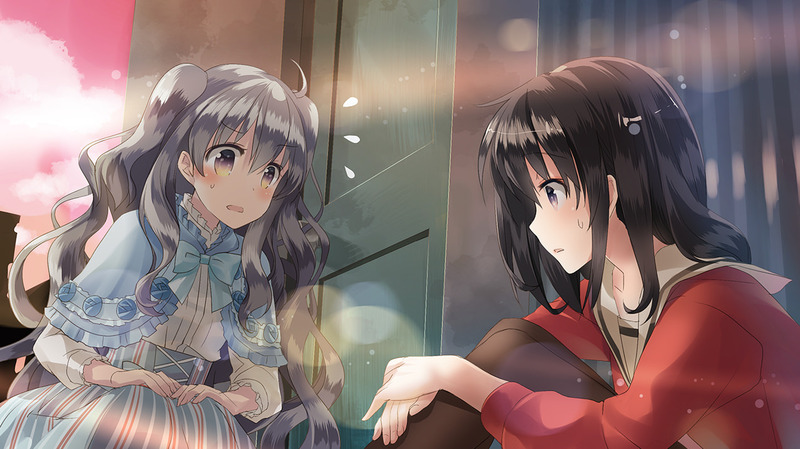 If you haven’t already, please also check out Mai’s translation group The Zärtlichkeit du Yuri. They so far provided us with quite a lot of awesome titles and one of my current favorites even, so why not visit her and say hi? This entry was posted in Guest Review, Visual Novel, Visual Novel Review, Yuri and tagged Kotonoha Amrilato by Lena K.. Bookmark the permalink. Reblogged this on The Zärtlichkeit du Yuri. Hoozay, thanks again for the opportunity! Wow, this looks really cute and fun. The language part looks a bit daunting (I barely know one language), but you make it sound like it’s very approachable. I do loves me a fluffy VN, so here’s hoping we get a translation! How timely, seems we already have doujins!